Digital eye strain also impacts your ability to focus and lessens productivity. Most people in Kincardine do nothing to ease their discomfort from these symptoms because they are not aware of the cause. 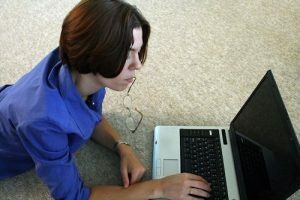 There are a number of options for reducing digital eye strain and your exposure to blue light which include workspace ergonomics, computer glasses, specialized lenses and protective coatings. The first step is to get a comprehensive eye exam in Kincardine, making sure you speak to your eye doctor about how often you use a computer and digital device. This will help your optometrist get the full picture of your eye and vision needs in order to determine which option is best for you. It was also help the doctor to identify any underlying issues that could be worsening your symptoms. Computer glasses reduce eye strain by adjusting the focus slightly so your eyes feel like they are focusing on something further away. They also have a tint to remove the glare and block blue light from entering into your eyes. There are a number of options for Kincardine computer eyewear, both if you need prescription eyewear and not. Speak to your eye doctor about what the best options are for you. It is important to know that both adults and children alike are susceptible to computer eye strain from computers and digital devices. With the growing use of such devices in our everyday lives it is important to start educating ourselves and our children on how to combat the negative effects of these habits. Make sure your family is protected and book your eye exams, today.